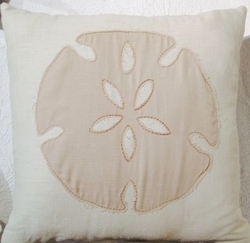 Our Coastal White Sands Sand dollar Pillow measures either 18x18 or 22x22. Please use the drop down menu to make your selection. Each Pillow comes complete with pillow insert and zipper for easy care and cleaning. This pillow has a linen like appearance with a seashell applique with raw edges.